Called Beyond the Visible, the 24-minute movie tells the behind-the-scenes story of the operation and scientific achievements of the VLA, which has been at the forefront of astrophysical research since 1980. Spectacular ground and aerial footage of the iconic radio telescope is augmented by first-person interviews with staffers who keep the telescope working and scientists who use it to discover exciting new facts about the Universe. The documentary also depicts many of the technical tasks needed to keep the array functioning at the forefront of science. Links: The NRAO has made the video available for viewing online here. 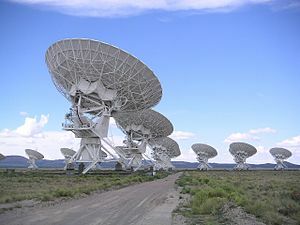 An earlier movie “Into Deepest Space” tells the story of the Atacama Large Millimeter/submillimeter Array (ALMA).